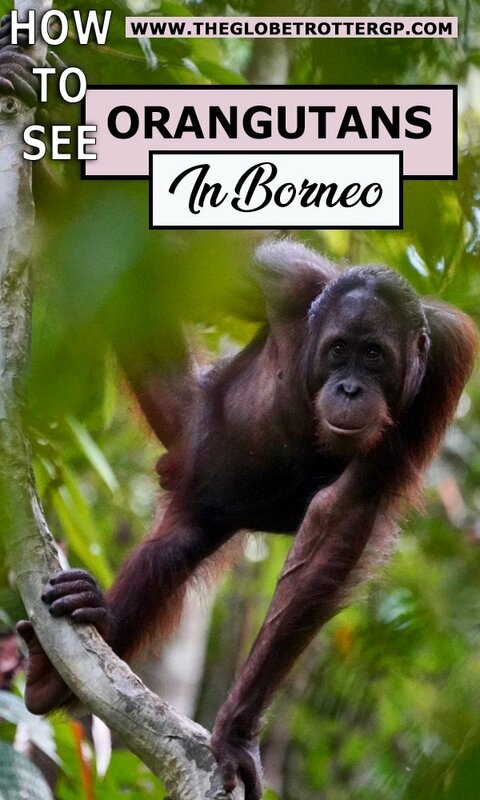 Seeing orangutans in Borneo is one of the main reasons that most tourists visit this beautiful island. It is also the same reason that I was pulled here. But spotting wild Orangutans in Borneo is not always easy which is why so many people choose to visit the Sepilok Orangutan Sanctuary in East Sabah. 1.1 Which countries have orangutans? 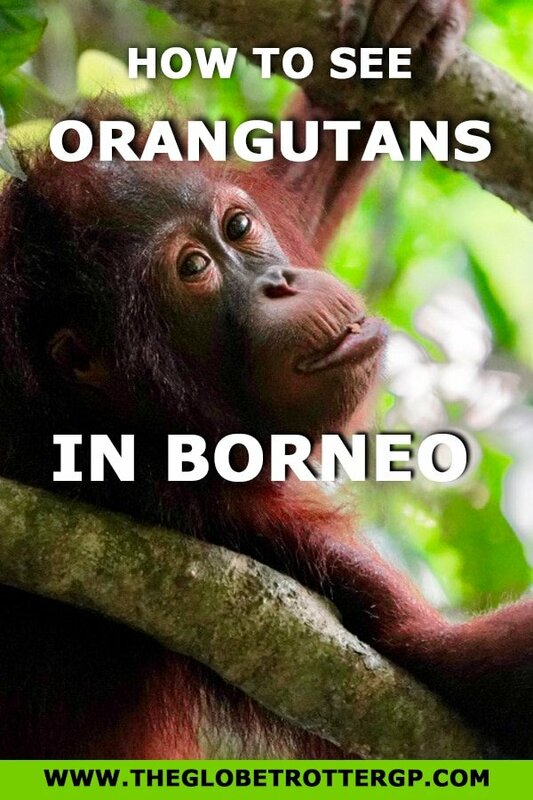 2.1 Why are orangutans endangered in Borneo? 3.1 What is Sepilok orangutan rehabilitation centre? 3.2 Where is it the Orangutan rehabilitation centre? 3.3 What should I expect when I visit Sepilok Orangutan sanctuary? 3.4 How much does it cost to visit Sepilok Orangutan Sanctuary? 3.5 How close can I get to see organgutans? 3.6 Is it guaranteed that I will see orangutans at Sepilok rehabilitation centre? 3.7 When is orangutan feeding time? 3.8 Will you see baby orangutans? 3.9 Is it safe to be so close to the orangutans? 3.10 Can I take photos of the orangutans? 3.11 Will I get to see any other animals at Sepilok rehab centre? 3.12 Are there any other orangutan rehabiltation centres in Borneo that I can visit? 4 Additional Tips for seeing orangutans in Borneo. 5.1 How to get to Sepilok? 5.2 Where to stay in Sepilok? 5.3 Where to eat in Sepilok? 7.3 Talk about it and raise awareness. In Malay, ‘Orang’ means human and ‘Utan’ comes from ‘hutan’ which means forest. Therefore the name translates to ‘humans of the forest’ and it’s easy to see why with their human-like faces. Although in zoos, they are seen in groups playing, Orangutans in the wild are actually solitary animals. They stay with their mums until they are between 6 and 8 years old before flying solo. Orangutans have huge arm spans – up to 8 foot which is considerably longer than their height span. In the wild, their lifespan is usually between 30-40 years. In captivitiy they can live up to 60 years. 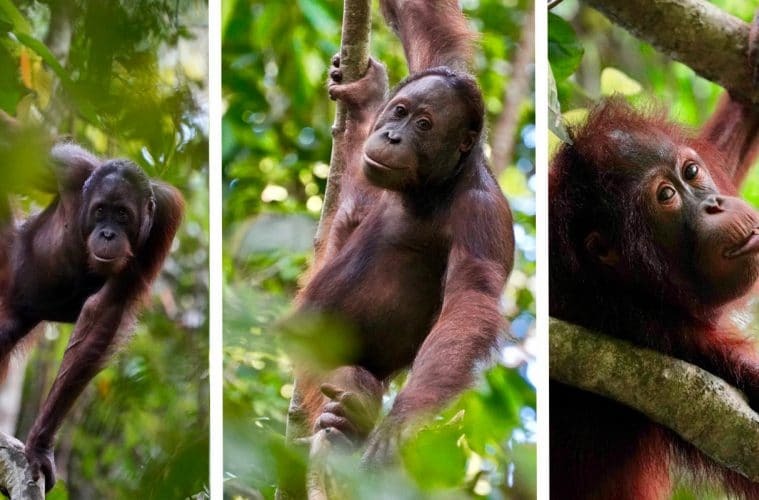 There are 3 species of Orangutans, the Bornean, Sumatran and now more recently, the critically endangered Tapanuli orangutan which was only discovered in 1997. Oragutans are only found on Borneo and Sumatra. (Brunei, Malaysia and Indonesia.) 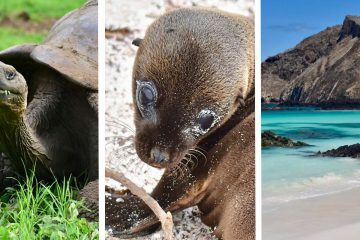 You may find them in zoos elsewhere but these are the only places where you can see them in the wild so it is a real priviledge. Currently 80% of the Orangutans in the wild reside in Borneo. Why are orangutans endangered in Borneo? Deforestation has occured at an alamrming rate to make way for palm oil plantations. Orangutans need approximately 12 square kilometres of rainforest to live and so where there is less rainforest, there are less orangutans. There is often illegal trade of orangutans and people keeping them as pets illegally which further adds to the problem. There are various Orangutan rehabilitation centres which you can visit but Sepilok is the oldest and the most popular. It is also very easy to reach being so close to Sandakan airport. What is Sepilok orangutan rehabilitation centre? Set up by the Orangutan Appeal UK in 1964, the Sepilok orangutan sanctuary is aimed to help repopulate Borneo’s rain forests with native orangutans. 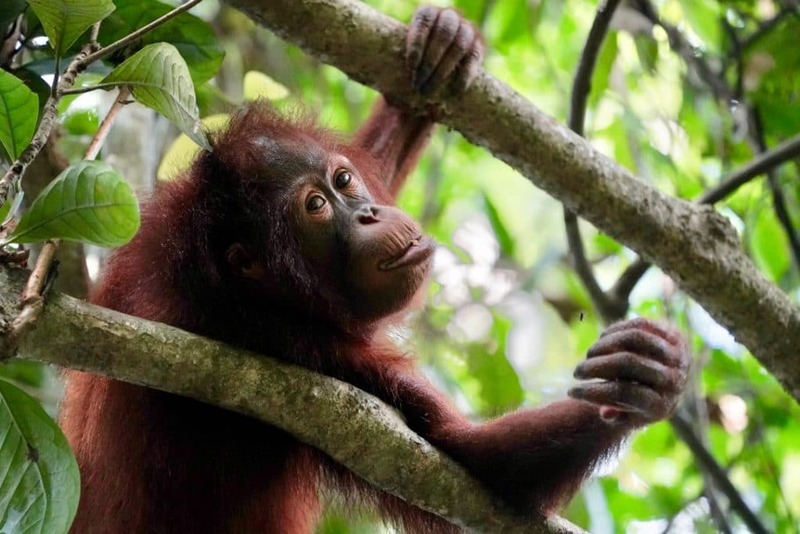 The orangutan is an endangered species and the rehab centre is helping to rescue orangutans that have been captured and sold for meat or kept as pets with the aim to rehabilitate them back into the wild and prevent their extinction . Where is it the Orangutan rehabilitation centre? The rehab centre is at Sepilok in East Sabah. It’s only an hours drive from Sandakan and from Kinabgatan River so it’s a popular part of Borneo to visit. What should I expect when I visit Sepilok Orangutan sanctuary? When you first arrive, you will be shown a video about the work that they are doing at the rehab centre. This lasts for about 20 minutes and the highlight is seeing one of the Orangutans have a complete meltdown because it is raining! After the video, you will be fired up to go and see the orangutans but first you will need to leave your bags in a provided locker. Cheeky orangutans have been known to steal from humans before so they suggest you only take your camera in with you. Before enterring the park, you will need to get a photography permit and then you are free to wander around the board walks scanning for orangutans in the nearby trees. Make sure you reach the feeding station early to get a good view as they can get busy! After watching the Orangutans at the feeding station (presuming they decide to turn up) you are free to wander at your leisure. Most people head for the nursery where you can see the younger, less experienced Orangutans, though this time it will be from behind a glass screen. After you’ve had your fill of orangutan-cuteness, there is a gift shop and a cafe to visit. Though if you are looking for a cute cuddly orangutan toy as a souvenir or gift, you might be disapointed! How much does it cost to visit Sepilok Orangutan Sanctuary? It costs just 30 RM to visit the Sepilok orangutan sanctuary and this allows you to visit for both feeding sessions. You will have to pay extra to take photos. How close can I get to see organgutans? As close as the Orangutans want to get though make sure you don’t touch them. You are supposed to stay 6 metres away at all times and you should absolutely try to do this. However, there were times when I was walking along the boardwalk when the Orangutans would walk straight past me on the railings. When this happens, keep walking and give them as much space as you can. Remember they are still wild animals. Is it guaranteed that I will see orangutans at Sepilok rehabilitation centre? No, it is not guaranteed. These are wild animals which are free to roam. 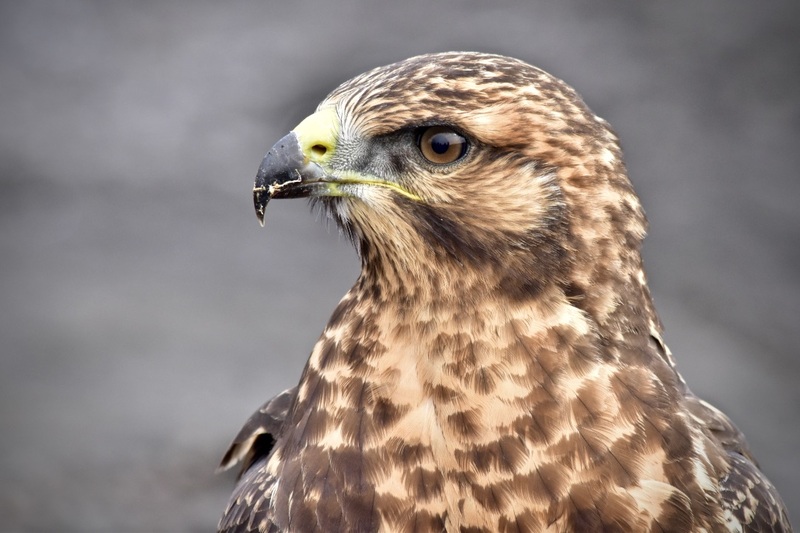 If they do not attend the feeding station, it is a good sign that they are becoming more self-sufficient and are getting closer to being able to be released. No Orangutans came to the feeding station when I was there – instead, we were joined by a huge family of pigtailed monkeys, a squirrel and a baboon! But 2 minutes later, I was walking along the board walk when we spotted an orangutan in the trees. 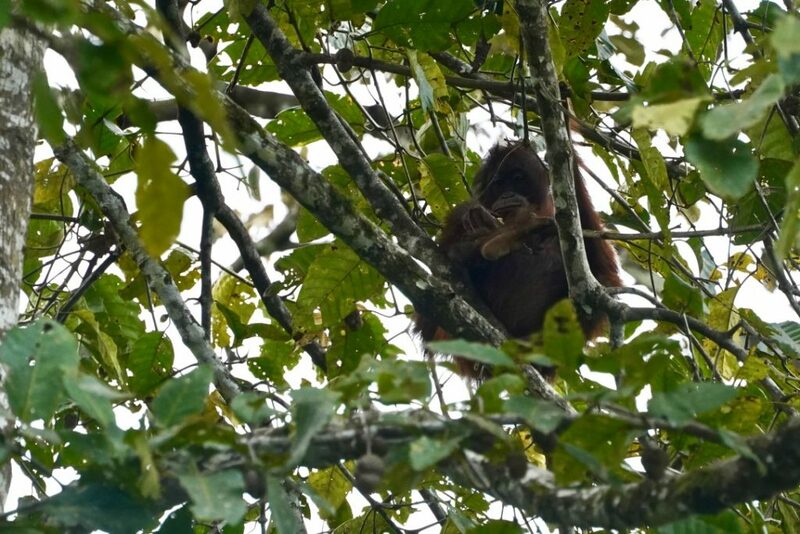 This was actually a wild Orangutan rather than a rescued one but a few minutes later a rescued Orangutan came to investigate and we got to see them playing together in the trees just a few metres from us. If you don’t see any Orangutans roaming freely, you are very likely to see some in the nursery where the younger rescued Orangutans are kept. You will be able to see these being fed through a glass screen, however, I much prefered seeing the Orangutans roaming freely in the rainforest. When is orangutan feeding time? 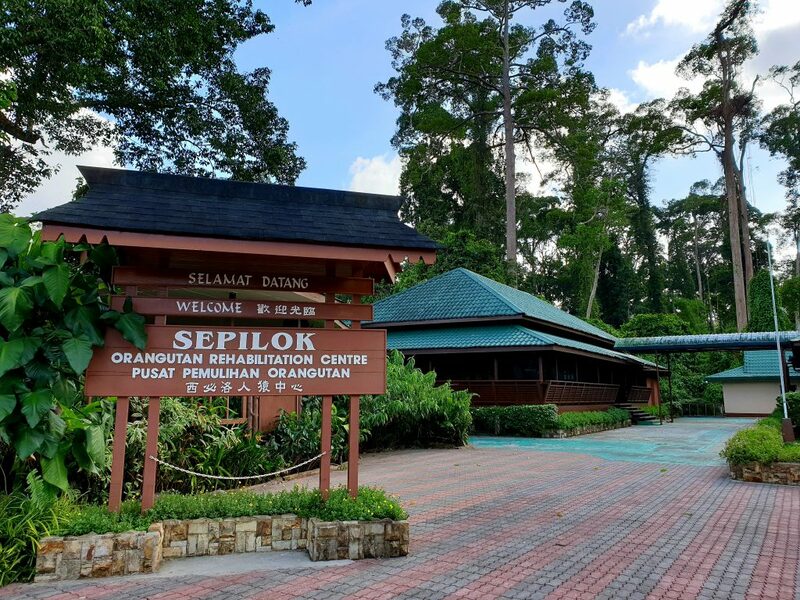 The Sepilok orangutan sanctuary opens at 8:45 and closes at 16:00. Get there early as you will need to purchase a ticket, store your luggage and watch the introductory video before feeding time. If you are visiting in the evening, I would recommend you aim to arrive at around 13:45-14:00. Will you see baby orangutans? Possibly, if you are lucky. You won’t get to see the orphaned baby rehabilitated orangutans as they are at a crucial point in their rehab process and are kept away from tourists. You may see some juvenile Orangutans at the nursery before they are released to the next stage of rehab. 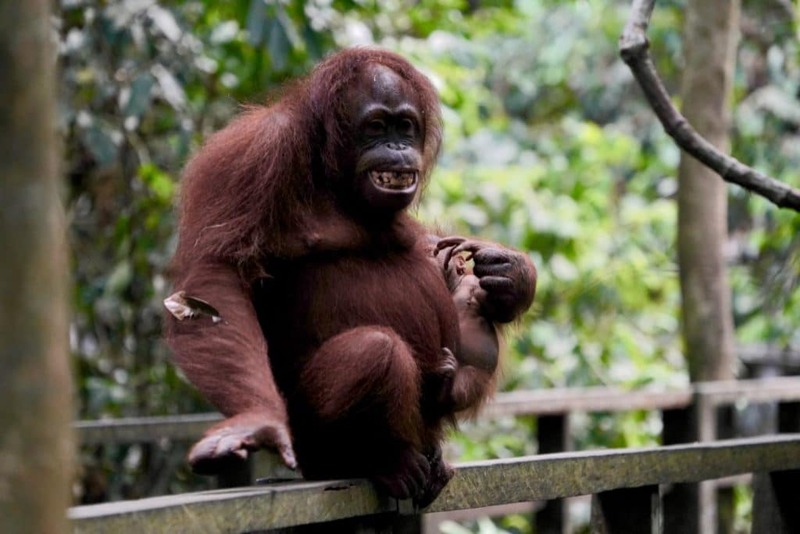 However, some of the older orangutans which roam free, also have their own babies. The first Orangutan I saw close up, was cradling a tiny baby who must have been only a few weeks old at most. It still had barely any hair. Very cute. Is it safe to be so close to the orangutans? Orangutans are wild animals so there will always be potential risk. However, if you give them space and avoid doing anything to distress them, you should be just fine. They are used to being around people. If an Orangutan has a baby with it, give it even more space than you would otherwise. Getting too close to the Orangutans can also be risky for their health. Sharing so much DNA with us means that they are at risk of catching infections from us which can make them really poorly. Keep your distance! Can I take photos of the orangutans? Yes, you can but as with any wildlife photography, please do not use a flash as this can dazzle the Orangutans. You will have to pay a 10 RM fee for each camera you take in (about £2 or $3) but remember this money is all ploughed back into rehabilitating these Orangutans. Will I get to see any other animals at Sepilok rehab centre? 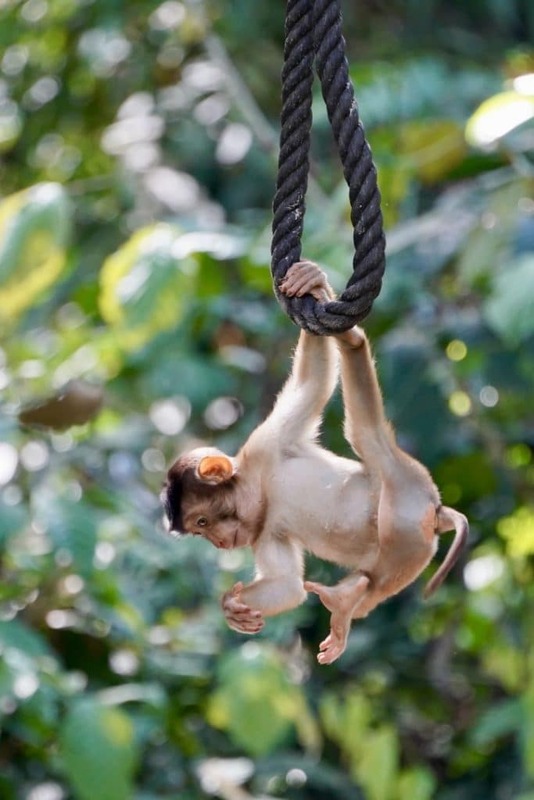 You will likely see cheeky monkeys and gibbons trying to steal the Orangutans food! But as there is open rain forest, you may see a variety of animals and birds. Just next door to the Sepilok Orangutan Rehabilitation centre is another rescue centre, this time for Sun bears – the worlds smallest breed of bears. They are seriously cute so definitely make sure you visit the Sun bear sanctuary whilst you are in Sepilok. Are there any other orangutan rehabiltation centres in Borneo that I can visit? Yes, there are other rehabilitation centres in Borneo but Sepilok was the first one to open. 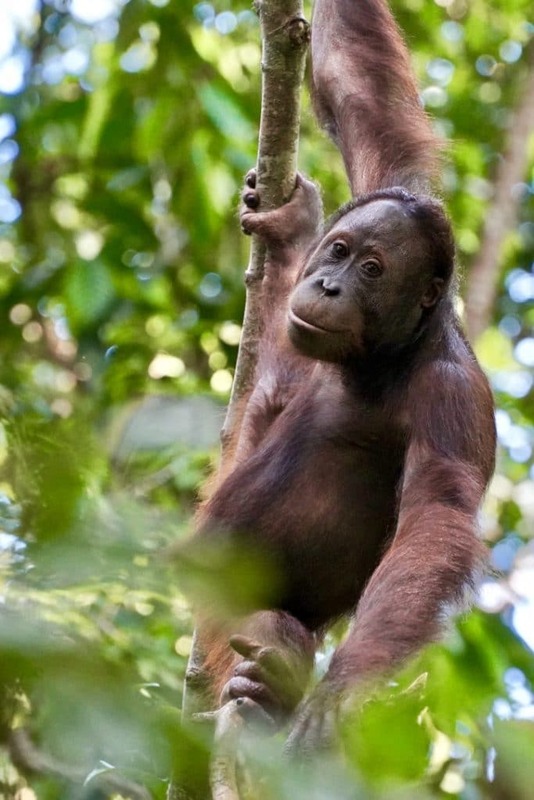 Additional Tips for seeing orangutans in Borneo. Consider going for the afternoon feeding session. There is equal chance of seeing the Orangutans at both sessions but the afternoon session is always a lot less crowded. Be organised and try not to faff at the locker room. Everyone heads straight for the feeding platform and if you visit on a busy day, you might find yourself too far back to get a good view for photos. How to get to Sepilok? Sandakan has a small airport. You would usually fly via the much larger International airport Kuala Lumpar. Flights between Kota Kinabalu and Sandakan are incredibly cheap and it only takes 45 minutes. I actually saw flights for £10! Once in Sandakan, you can easily organise a day trip with included transport. Otherwise there are local buses which travel betwen Sandakan and Sepilok frequently. I use Rome2Rio to find any bus and public transport timestables and approximate costs. Where to stay in Sepilok? I would recommend staying overnight or even for a few nights in Sepilok if you can. I stayed at the Sepilok jungle resort and I loved it there. 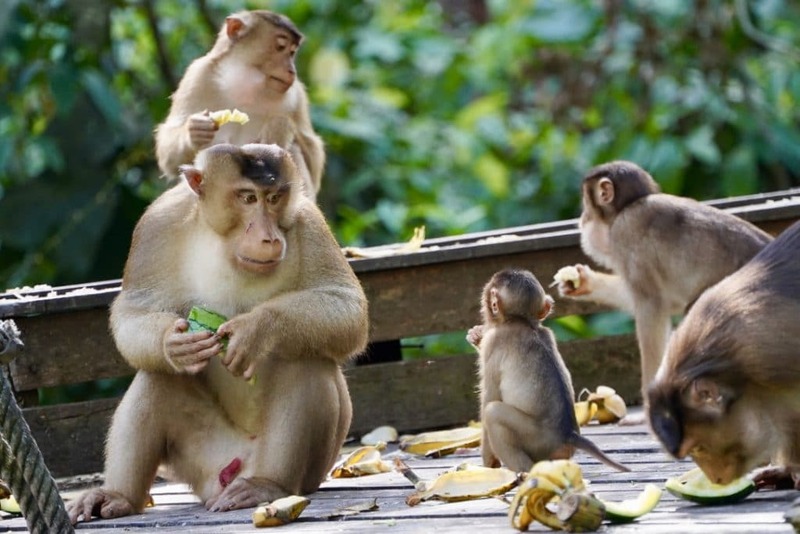 Firstly, it’s just so convenient – a mere 5-minute walk from the Orangutan centre and Sunbear rescue centre. Then there are the beautiful gardens the resort is set in. 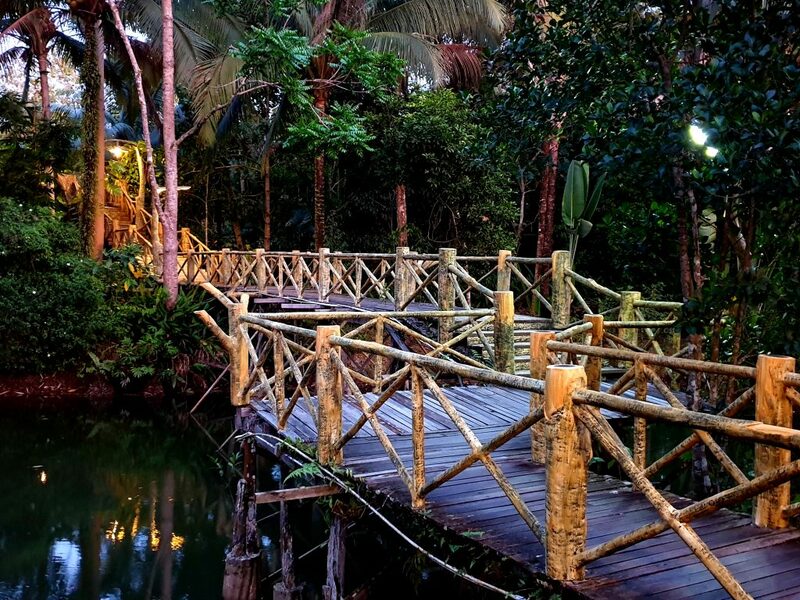 Tropical flowers and pretty quaint wooden bridges lit up with lanterns at night all leading to a really nice outdoor restaurant where they serve delicious food. The resort also has a good sized swimming pool with a pool bar and plenty of deck chairs and spaces to relax. The rooms are admitedly quite basic but they were comfortable with air con and a comfy bed. The only let down for me was a cold shower! But with tropical weather, that’s not always a bad thing. I would still definitely recommend you stay here and would be happy to go back again myself. There are not many places to stay near Sepilok so I would recommend booking in advance. Where to eat in Sepilok? There is a small canteen just outside of the two rehab centres. It’s fairly cheap and very convenient. The food was fine but I think possibly the local food was better than the western options. 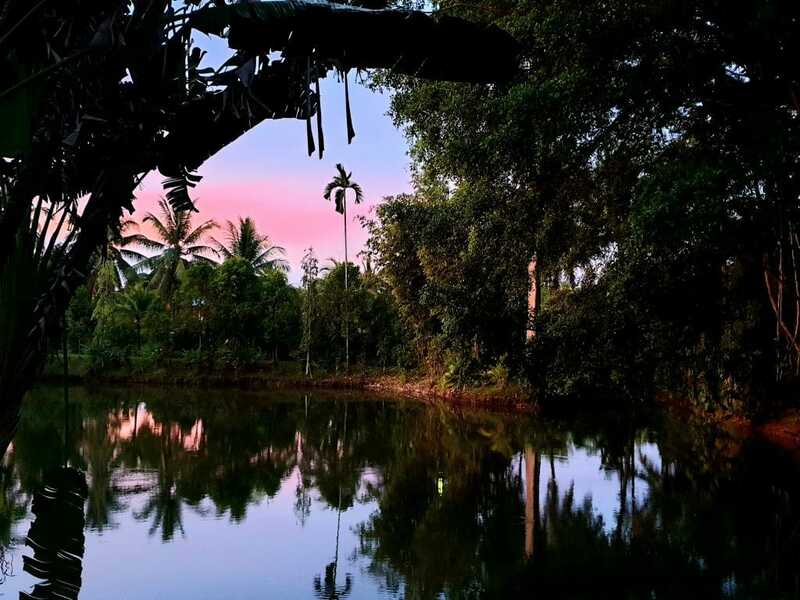 If you are staying at the Sepilok jungle resort, then definitely have dinner at the restaurant on site – the food was delicious and the setting in the tropical gardens, really lovely. The only downside was there weren’t many affordable options for alcoholic beverages unless you happen to be a beer drinker. Thats said the mixed tropical fruit juice was delicious – I had several with my Singapore noodles. Yum. If you decide you want to try and see Orangutans in the wild then the best place to achieve this would be Kinabatangan River. Wildlife often congregates by the river for access to water so you may see a huge variety of wildlife on a river safari. 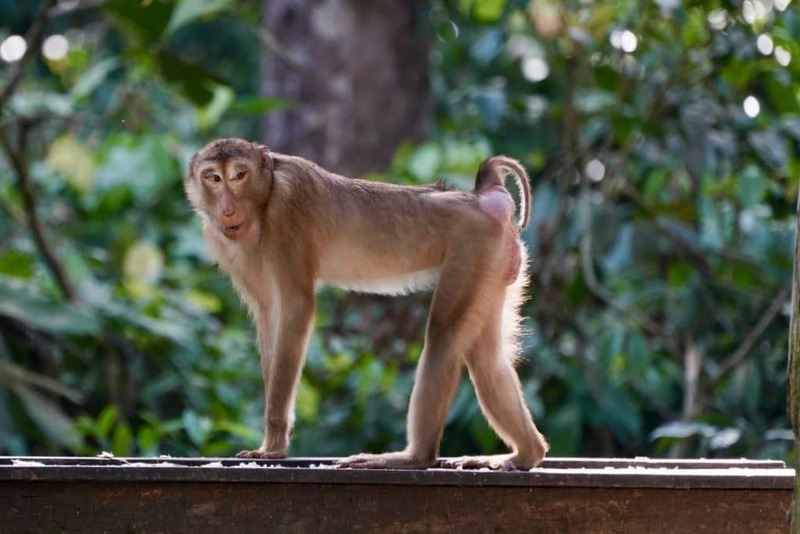 You are likely to see various breeds of monkey including the very cute Probiscus monkeys with their upturned noses. If you’re lucky you may even see crocodiles, pygmy elephants and the more elusive leopard. Seeing an Orangutan is not a guarantee. In fact, they can be tricky to spot as there are not so many of them! But we did spot a wild orangutan on our 2 day wildlife safari. Your chances are considerably greater if you stay a few days and take several boat trips. We took 4 river safaris and 2 jungle walks and saw just one orangutan. If you want to contribute directly towards the Orangutan Appeal, you can donate here or you could consider adopting an orangutan at Sepilok orangutan rehabilitation centre. Palm oil is in so many day-to-day products and foods which we come into contact with many times each day. From frozen pizzas to margarine to makeup and beauty products, palm oil is everywhere. Unfortunately, this demand for palm oil has caused the destruction of many rainforests to make way for palm tree plantations. By avoiding palm oil where you can, you will be helping to reduce the demand and therefore help to boycott palm oil and prevent deforestation. Talk about it and raise awareness. Just talking about deforestation and the damage the palm oil industry is having on these beautiful animals can help to raise awareness of the problem. The more aware people are, the more people are likely to boycott palm oil or may consider donating towards the protection of these rainforests. 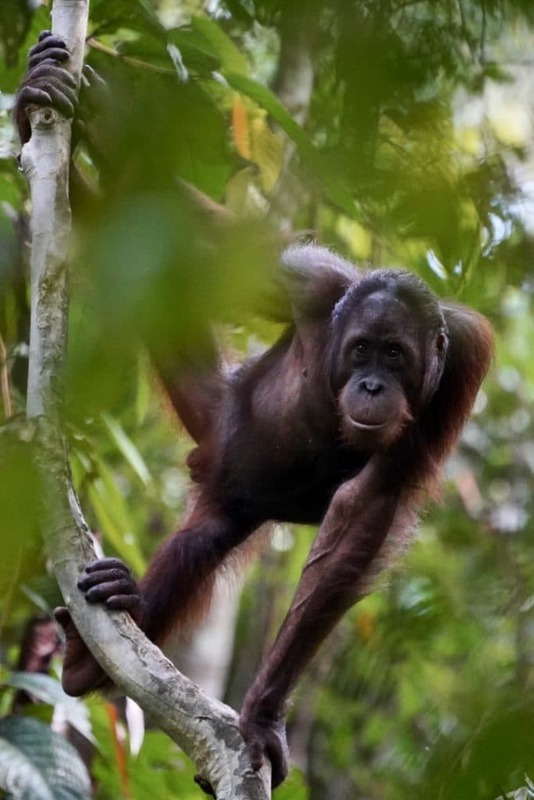 I hope this article has helped to answer some of your questions about seeing Orangutans in Borneo and visiting the Sepilok Orangutan Rehabilitation Centre. If you have any other questions, feel free to pop them in the comments below and I’ll do my best to answer them as soon as I can. The best 2 week Indonesia itinerary for seeing volcanoes, beaches and dragons.